It feels like drones are everywhere you look in the news right now: delivering post, catching exam cheats and disrupting just about every industry they can buzz their way into. These unmanned aerial vehicles (UAVs) look to have a big future ahead of them, provided they can stay ahead of government rules and regulations. In the last couple of years the technology required to build drones has become cheap and light enough to make them a viable option for hobbyists. Major corporations and amateur inventors alike are falling over themselves to add new technology and capabilities, and we've put together 10 points you need to be aware of regarding the drone invasion. 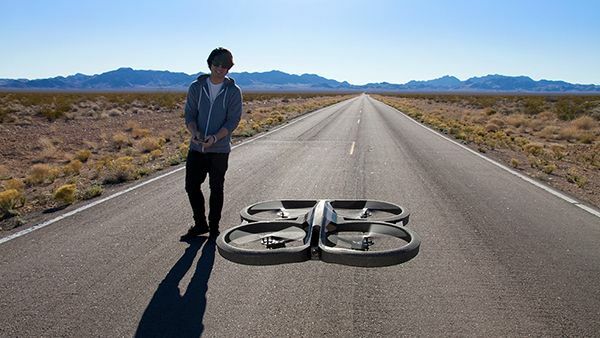 Best drones: our pick of the top UAVs is right this way. The reason more of us are buying drones is because prices are coming down: you can pick up a decent quadcopter drone for £100-200, though the top-end models obviously cost a lot more than that. If you're looking to become a drone pilot yourself then you should be able to find a model that matches your needs and budget - there are plenty to pick from. You might be happy pootling around the back garden on your own, but other drone owners are much more competitive. The UAVs have inspired a whole new series of sports and pastimes, from racing around a forest to performing indoor stunts in a car park. If you want to take your drone flying to the next level then there are plenty of opportunities to do so. Part of the appeal of a drone is the ease with which you can hack and customise it to suit your own needs. Without too much technical know-how, it's possible to change the look and functionality of your personal flying machine, and you can find plenty of inspiration from other drone owners: Star Wars mods seem to be a particularly popular option right now. The idea of having Amazon deliver your packages via drone sounds ridiculous to begin with, but it's not that far-fetched - and it would bring a host of benefits with it. Deliveries could reach rural areas more quickly, there would be less traffic on the roads, and the drone could even zero in on your smartphone's GPS to bring the package right to wherever you are. Drone deliveries aren't just useful for getting the latest books and gadgets to your doorstep in record time: they could make a huge difference in emergency response situations where the traditional road and rail infrastructure has been disrupted. Drones can deliver medical supplies to remote regions or stranded survivors where planes and trucks can't get to. Delivery drones don't necessary need a camera fixed to them but in many cases the add-ons are crucial to getting the most from a UAV. One area where we've already seen them used is in filming live sports - drone cameras can keep up with the action as it progresses and get aerial angles that just aren't possible with a regular television camera and operator. Governments around the world are currently grappling with drafts of rules and regulations to make drones safe to operate. Keeping them away from airports, power lines and each other is obviously essential, and as more and more UAVs take to the skies it becomes more important to set down guidelines governing what is and isn't permissible. Drones are already being used to keep an eye on Chinese students during exams and if you're of a paranoid nature then you might be worried about how drones could be deployed to spy on citizens or over neighbour's fences. The US government is busy using drones to keep an eye on the extensive US-Mexico border at all times of the day as well. Even the most expensive drones struggle to stay in the air for much beyond 20 minutes and travel more than a mile: at the moment there's no change of you being able to fly a drone across the country (which is perhaps a good thing). Big advances have been made in recent years and there's plenty more room for improvement when it comes to UAV technology. Whenever there's a camera involved, you can add augmented reality to the mix. Drones can be used not just to send back a live camera feed from the sky but to overlay AR on top - that could be anything from area estimations (for farmers looking to plan their crop planting) to computer-generated targets and explosions (for gamers wanting some extra drone action). Liked this? Check out our roundup of the best Lego sets!